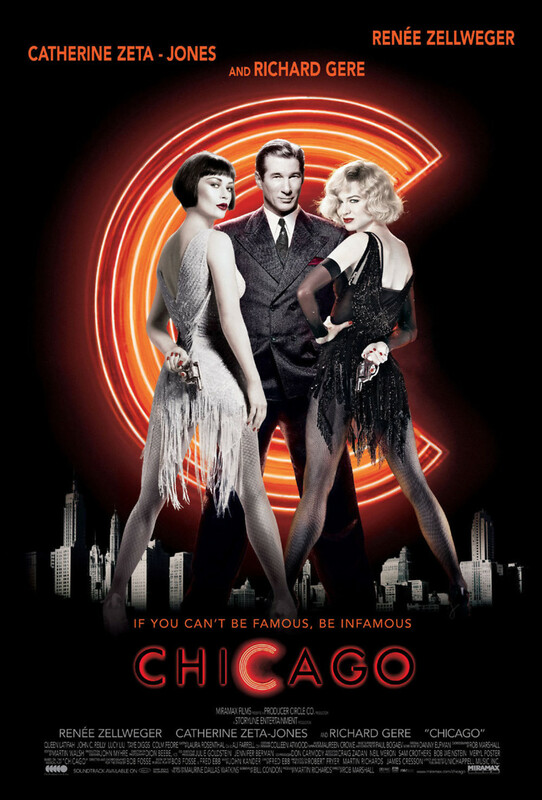 The slick film adaptation of "Chicago" stars Renee Zellweger as murderess Roxie Hart, who seeks the assistance of slick lawyer Billy Flynn (Richard Gere) to get her off the hook. The movie features an A-list cast, including Queen Latifah, Catherine Zeta-Jones and John C. Reilly, all showing off their vocal chops in this glitzy musical set in the underbelly of crime-soaked Chicago of the 1920s. The movie is highly stylized, presenting songs in a beautifully choreographed and highly creative manner. Many of the numbers cut back and forth between what is actually happening and a glammed-up dream vision of how the characters might perceive it to be. This blurs the line between reality and imagination in a provocative way that thrilled some viewers and frustrated others. The movie took home six Academy Awards, and it showcases such memorable songs as "All That Jazz," "Funny Honey," "Mister Cellophane" and "Razzle Dazzle."